Audio recordings of many of the NGS lectures are available for sale and download at PlaybackNGS. There were many fantastic sessions, some I made it to, some I missed due to speaking or other obligations, and so I’m compiling my list right now. If you couldn’t make it to NGS (or even if you did) this is a great way to hear some fantastic lectures. I thought Grand Rapids, Michigan and this NGS conference was one of the best I’ve been to. The level of education, the exhibit hall, and the city offerings were fantastic. Next year’s NGS is 8-11 May 2019 in St. Charles, Missouri. And 2020 will be 20-23 May in Salt Lake City, Utah. Mark your calendars! In my work as a professional genealogist, I have to be able to read old handwriting. I know others struggle with this, and I have a couple of tips to share that really helped build my confidence when it comes to reading old handwriting. My first tip and the best thing I can suggest is to take part in a volunteer indexing project. I signed up for the FamilySearch Indexing project the year it was released. I was onboard when the 1940 census was indexed in a matter of days, when the Civil War Pensions project was indexed, and for a whole host of state-organized projects through various state societies. After working on so many projects, I got really good at reading old and often messy handwriting. 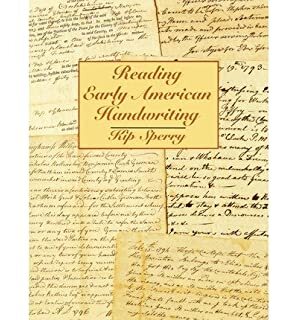 My second tip is to get the book Reading Early American Handwriting by Kip Sperry. You can find it at Amazon or another online bookseller. Truly the best way to get better at anything is to practice. I hope the above tips help you find your best way to practice and to also perhaps give back to the genealogical community at the same time.